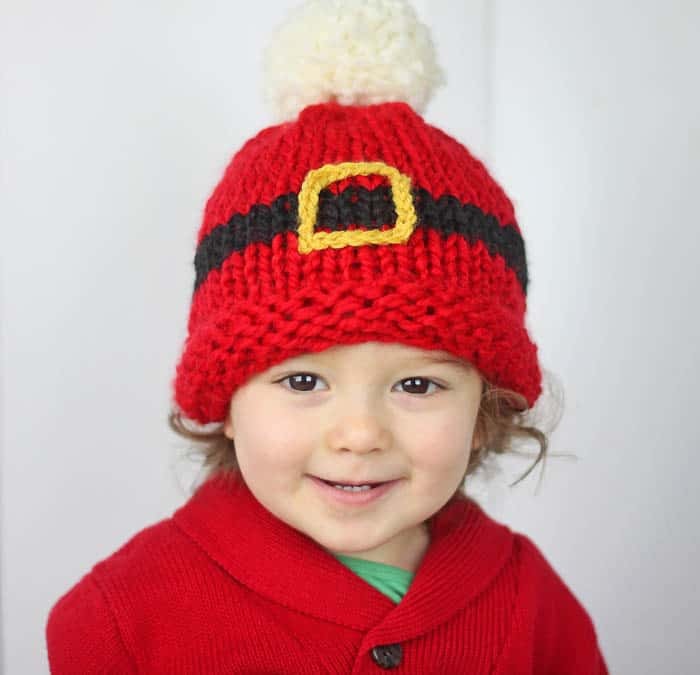 There’s just something about babies in Christmas hats that brings a smile to everyone’s face! Instead of doing the traditional stocking hat I thought it would be cute to make one with Santa’s belt buckle. 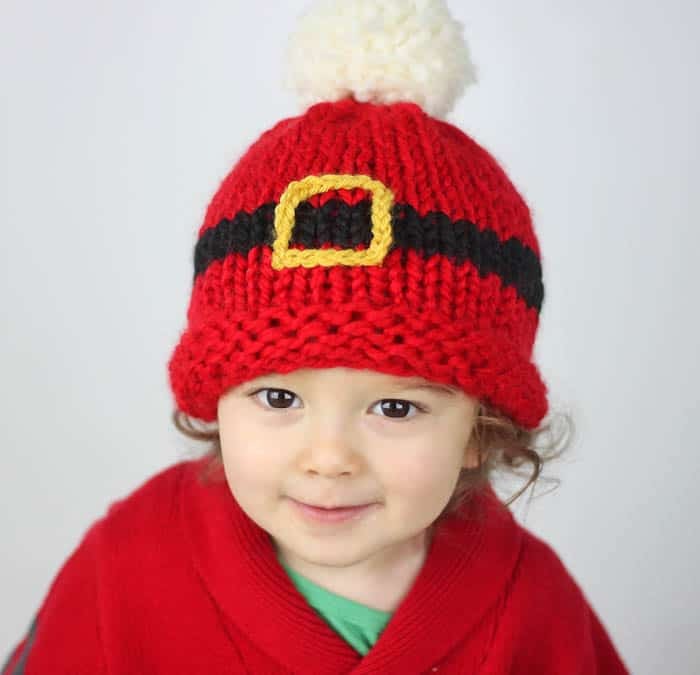 This knitting pattern is very easy and it only takes a few hours to make this hat. 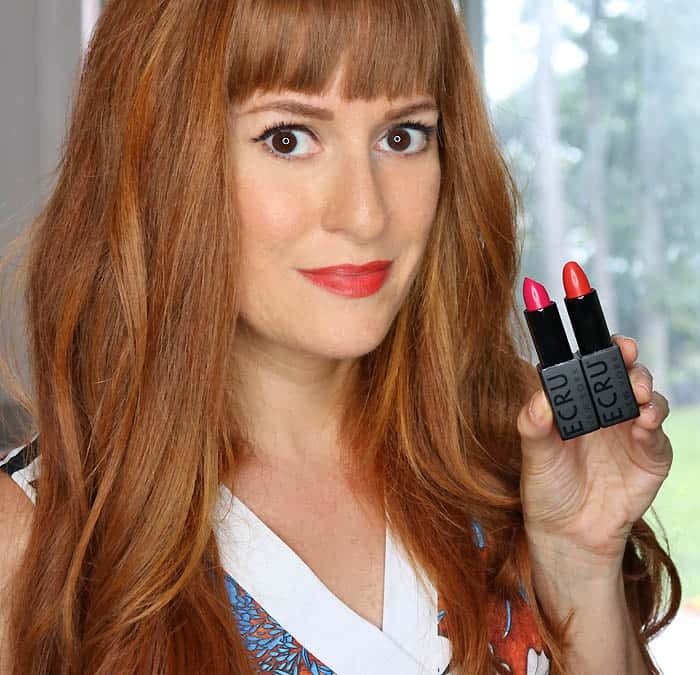 Perfect for the busy holidays! This knitting pattern features a black stripe and a gold buckle that’s chain stitch using a crochet hook and sewn on afterwards. It’s topped off with a big, fluffy pom pom. Be sure to check back frequently in the upcoming weeks. 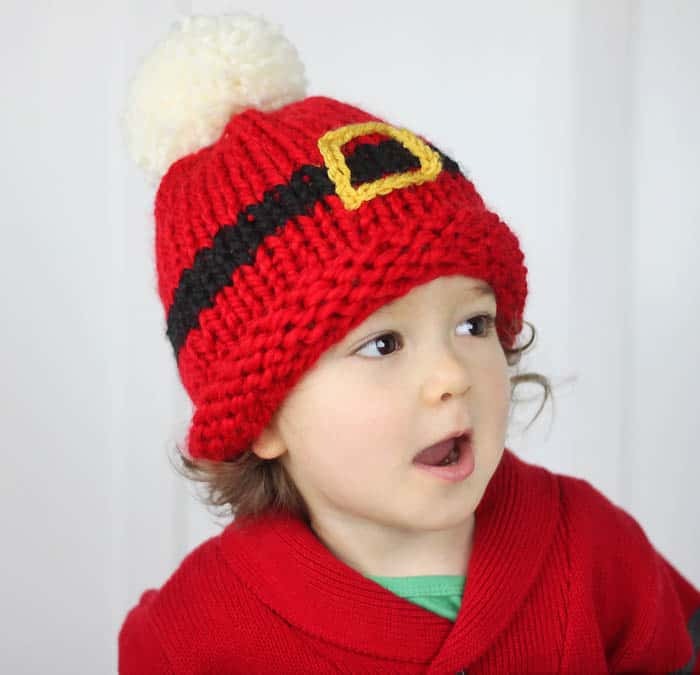 I have a bunch of fun, holiday-themed knitting patterns, DIYs and recipes planned! Scroll down for the pattern or click below to buy the ad-free, printable version for a small fee. The printable version is an instant download that conveniently prints on 2 pages. With the red yarn, cast on 32 (34) sts. Purl the first 4 rows. Knit in the round for 5 rows. Switch to black yarn and knit 3 rows. 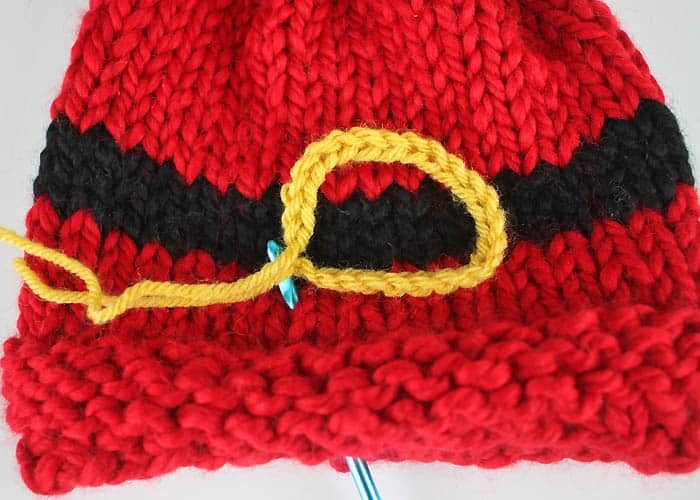 Switch back to the red yarn and knit until measures 6 1/2 (7) inches from the cast on edge. 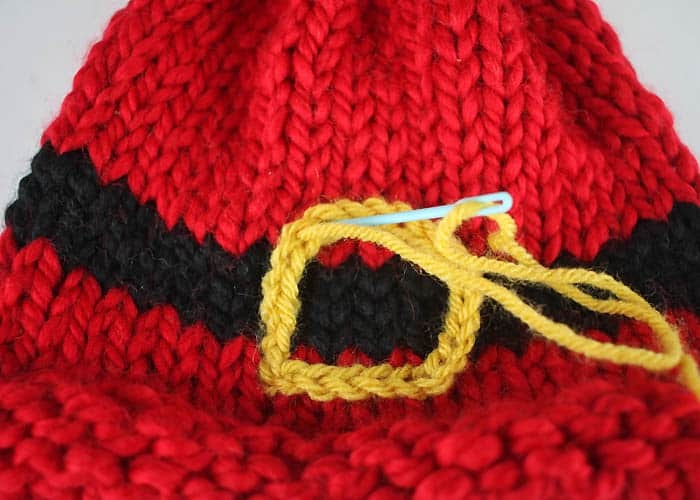 Knit 2 stitches together until you are left with 6 sts. Break the yarn and thread through remaining stitches. Pull to tighten. 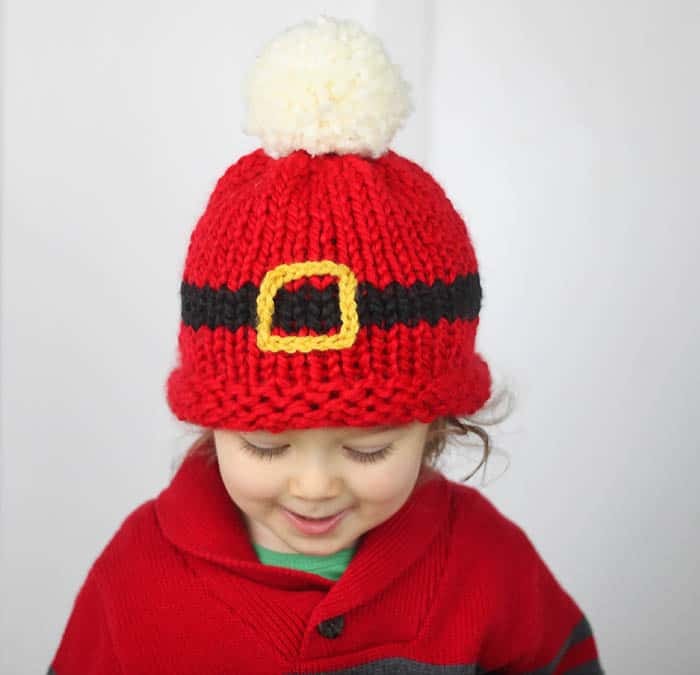 Make pom pom using the Homespun yarn. Here is my Perfect Pom Pom Tutorial if you need it. 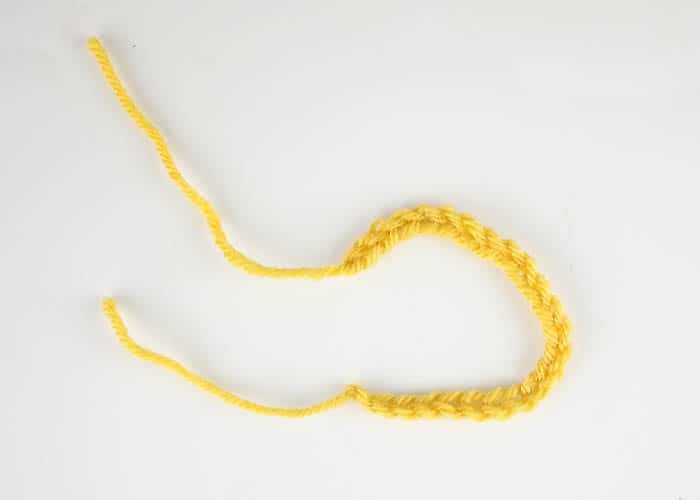 Using the crochet hook, make a chain of 24 stitches with the yellow yarn. Place the chain in the center of the stripe. Using the crochet hook pull the ends through the hat and make a knot. Make a stitch at the corners to square off the chain.